The stunning victory won by a force of about 1,800 backcountry "Overmountain Men" over approximately 1,000 Tories at King's Mountain on 7 Oct. 1780 has been justly described as a key turning point in the American Revolution. According to British commander Henry Clinton, the American victory "proved the first Link of a Chain of Evils that followed each other in regular succession until they at last ended in the total loss of America." The Tory force at King's Mountain was commanded by Maj. Patrick Ferguson, the son of a Scottish judge. At the Battle of Brandywine, Ferguson's right arm had been shattered. However, he practiced so assiduously that he learned to wield his sword with his left hand, earning him the nickname "Bulldog" in the process. A few weeks before King's Mountain, Ferguson, who guarded Lord Charles Cornwallis's left flank, led a foray to the vicinity of Old Fort in North Carolina. At about that time he bluntly warned the local revolutionaries that if they did not cease their rebellion he would march over the mountains, hang their leaders, and lay waste their settlements with fire and sword. This brought an indignant reaction from the backcountry forces and a conference between Cols. Isaac Shelby and John Sevier, who agreed that they should take the offensive. They called a rendezvous at Sycamore Shoals (now in Tennessee) for 25 September. On that day Sevier and Shelby arrived with 240 troops each to join Col. Charles McDowell, who was already there with 160 North Carolina riflemen. They were heartened when Col. William Campbell marched in with 400 Virginians. While the little army was marching over Roan Mountain, two of Sevier's troops, James Crawford and Samuel Chambers, were reported missing. Suspecting that they would warn Ferguson, Sevier changed the march plans. On 30 September the American force reached Quaker Meadows in Burke County, where it was joined by Col. Benjamin Cleveland and 350 North Carolinians. By 1 October the Americans were camped just south of King's Mountain. Rain kept them there a day while the officers elected Campbell commander. Ferguson was also slowed by rain and never reached Charlotte to join Cornwallis, as was his apparent plan. He had not intended to install his army atop King's Mountain, which had allegedly been named for a farmer who lived at its foot and not for King George III. The mountain, with its short and relatively level summit, must have impressed Ferguson as a good defensive position; he wrote to Cornwallis, asking for reinforcements and boasting that he was on King's Mountain and could not be driven off. Early on the afternoon of 7 October, the Americans arrived at the foot of King's Mountain, near where it extends into South Carolina. They launched a four-pronged attack, with two columns on each side of the mountain, led by Colonels Campbell and Sevier on the right and Shelby and Cleveland on the left. 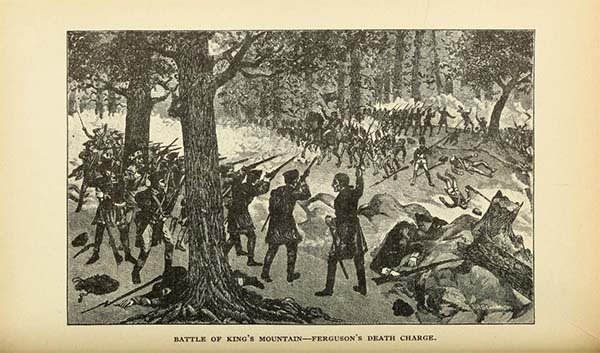 Ferguson and his men apparently were taken by surprise by the boldness and rapidity of the Overmountain Men's aggression. Over the roar of the battle could be heard intermittently a shrill shriek from the silver whistle Ferguson used to direct his troops. It was soon silenced, however, as Ferguson was killed while leading a desperate sortie by a few of his men to break out of the mountaineers' cordon. Capt. Abraham DePeyster, the second in command, almost immediately raised a white flag. However, several minutes elapsed before the surrender could take effect, and during that period several more Tories were killed. Some Americans kept firing because they did not understand what was going on, and others did so because they recalled that when Col. Abraham Buford, an American, was defeated several weeks before, British colonel Banastre Tarleton had kept on firing, an action Cornwallis had applauded. Finally the guns fell silent and the American victory was complete. In an hour's time, Ferguson and 119 of his men had been killed, 123 wounded, and 664 captured. The Americans had lost 28 killed and 62 wounded. The Americans were still so angry at their enemies that on their ride home, Campbell found it necessary to issue an order directing the officers to halt the slaughter of prisoners. Finally Campbell convened a court-martial to try some of the prisoners. According to Shelby, 36 men were convicted of "breaking open houses, killing the men, turning the women and children out of doors and burning the houses." Of those convicted, 9 were actually hanged. The American victory at the Battle of King's Mountain altered the tenor of the American Revolution, disheartening Cornwallis and his army, threatening and eventually altering British military strategy, and adding renewed vigor to the American cause. I'm looking for info on a Gen William Russell( for which Russell Co Virginia is named) and his son Col William Russell ( for which Russell Co Kentucky is named) both came with Gen William Campbell's division( father & son duo) the father later married Gen Campbell's widow Elizabeth Henry ( Gov Patrick Henry's sister) I have read that one of them was coined " The hero of King's Mountain" also the first to reach the summit and retrieve a sword if the vanquished enemy! I know the father was with Gen Campbell when they wrote a Declaration swearing their lives they would never surrender their rights of freedom of religion to any power upon this Earth except at the expense of their lives in Abingdon Va Jan 20 1775. The painting of the battle at the top of this page is most certainly not a painting of the Battle of Kings Mountain. Shame on you for not knowing: (1) the battle was fought in the woods on a mountain not in a gentle, rolling field; (2) there were no regular troops of the British Line or the Continental Army, hence no red coats and blue coats, in the battle. The battle was fought by Loyalist Militia and Patriot Militia, neither of which wore the uniforms presented in the painting. If the painting is to be considered a historical depiction of a Revolutionary battle in the south, is likely to be of the Battle of the Cowpens. Please correct this to give your readers a more accurate sense of the real historical event. Just to inform you that the image has been changed. Thank you for bringing this to our attention. We will investigate this. It could be that it is the artist's rendering of the battle. My 4th great grand father Robert Sevier died from being wounded during battle there. I too am a descendent of John and have done copious research on his family. I also portray him while doing Revolutionary living history. I live not far from his deeded land. Do you have anything on the German battle strategy Blitzkrieg ? Thanks for asking this question. Unfortunately, NCpedia doesn't really have anything specifically on the German military. There is an article that mentions Blitzkreig -- http://www.ncpedia.org/history/20th-Century/wwii-construction -- but that's about it. If you're looking for more information on this, you may want to visit a library to find resources on WWII or you may want to do some web searching. There are a number of good historical sites for WWII including the BBC and the British Museum. You might find something there.